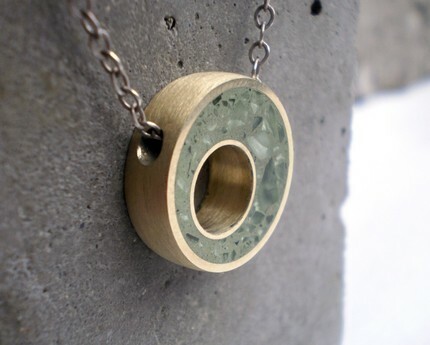 Crafted entirely by hand from different colors of concrete and crushed glass. The glass/concrete mixture fills formed stainless steel and brass. Some of the pieces created by this artist contain 75% post consumer recycled glass collected from local beaches. Check out the variety of shapes and sizes …clouds, lightning bolts, flowers, teardrops, hearts, and clovers! 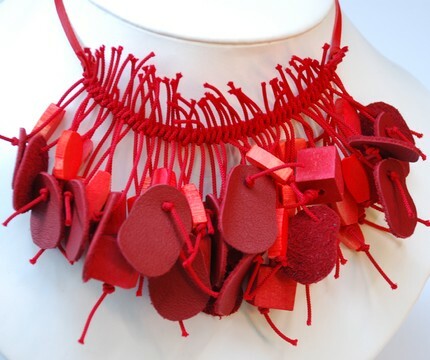 From Melbourne, Australia, the jewelry artist (or jewellerey artist) Mainichi creates playful necklaces from recycled upholstery leather and found materials. 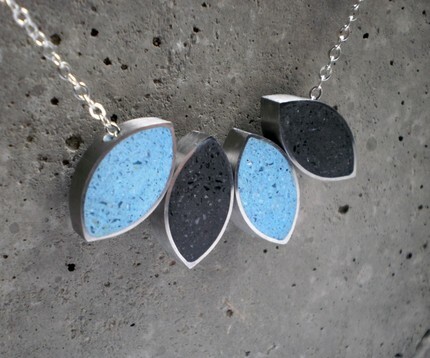 Many of her necklaces contain movement with hanging, dangling strings and objects. 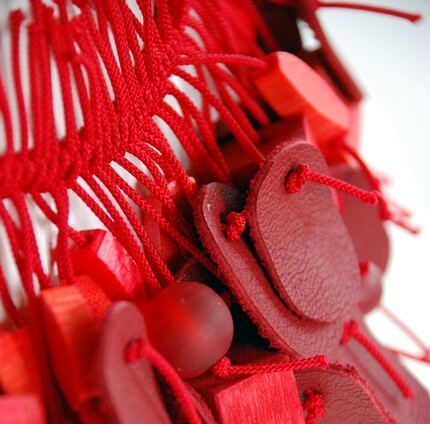 Other pieces consist of layering leathers with vintage Japanese kimono silk fabric or felt with stitched details. Simply gorgeous. 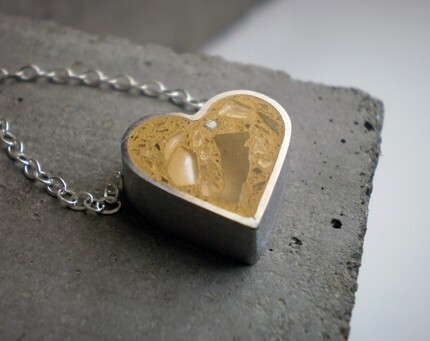 Read about her adventures in jewelry design, interior design and parenting on her blog: http://www.mainichidesign.blogspot.com/ and check out her flickr site…it is inspirational! I found two etsy artists that are doing amazing work with fused plastic from recycled plastic grocery bags. … true trash to treasure! First is San Diego artist, Emily Grace from Emily Grace and the Yellow Suitcase. 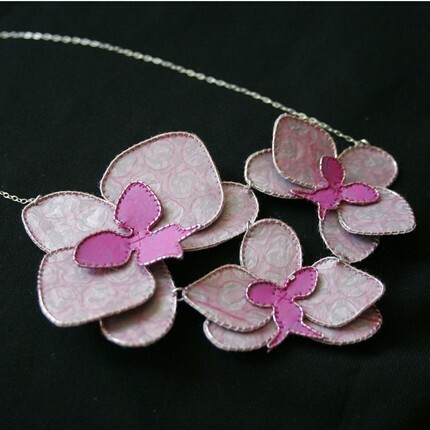 Her designs are made from heat fused plastic which is then hand-stitched to wire and then combined with sterling silver chain and occasionally some vintage beads. The pieces are soft and pliable and can be left lying flat or gently sculpted into a more three dimensional shape for special occasions or the perfect neckline. The second artist working in fused plastic from recycled plastic bags is Cynthia Del Giudice located in the Argentine Pampas outside Buenos Aires, Argentina. 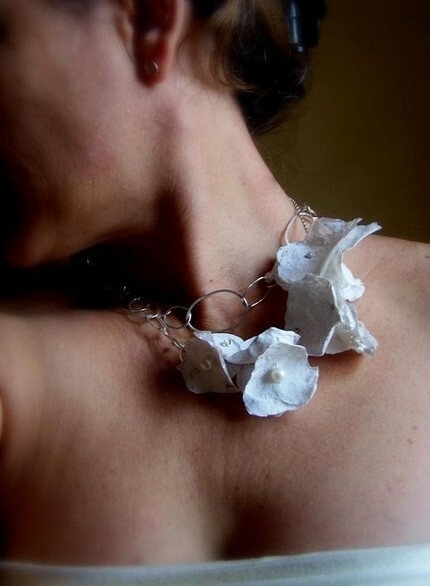 Cynthia combines delicate flowers made from recycled plastic grocery bags with cultured freshwater pearls and sterling silver chain. 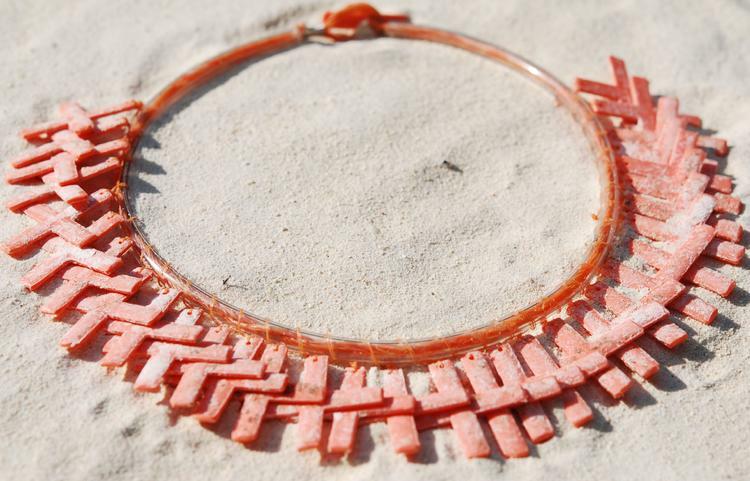 So dainty and beautiful …and what a lovely conversation piece to raise awareness of plastic pollution. Quote: For the contemporary, art loving, recycling, eco-friendly woman who dares to to wear jewelry that is out of the ordinary. Here’s a few good tutorials for fusing plastic. Don’t forget to work in a well-ventilated area….the fumes can be toxic! 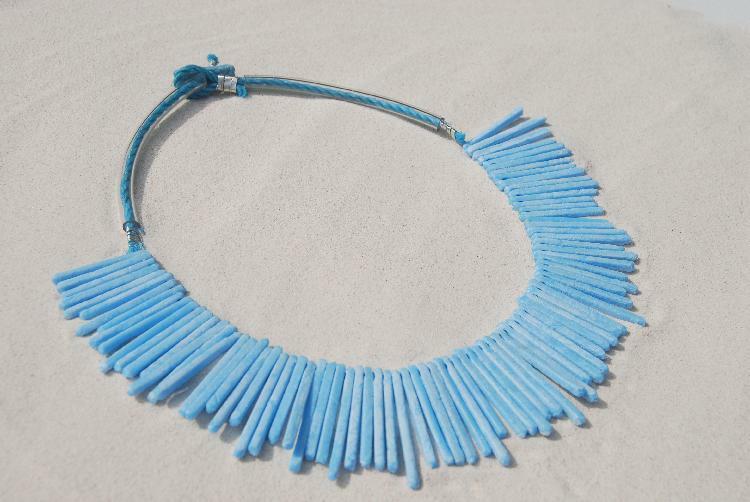 Turquoise Grid Neck Piece – $450.00 – Created from a turqoise blue crate that had been rolling around in the ocean for years and strung on found blue fisherman rope. 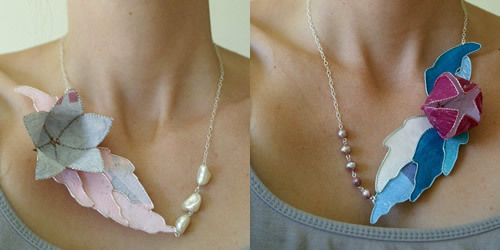 A percentage of the proceeds of these jewelry pieces will go towards the Cape Eleuthera Institute. An organization based in the Bahamas, which researches resource management and sustainability geared to marine and island life. 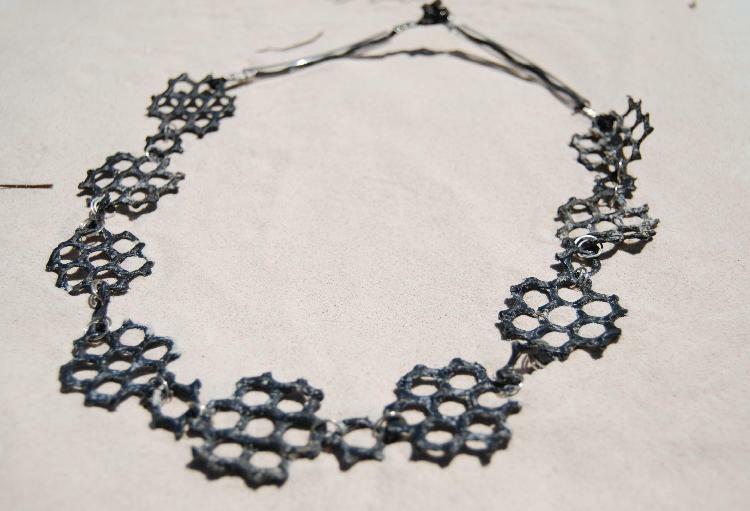 If this is your thing, more recycled plastic jewelry from the oceans can be found here. Fake Plastic Fish, The Rubbish Diet and My Zero Waste. This post was inspired by reading Plastic Pollution Coalition’s Facebook Fanpage. Picture this skirt with a pair of flipflops and a plain white t-shirt…maybe throw on a cowboy hat too. Created from vintage tablecloths and bias cut for a flattering look. 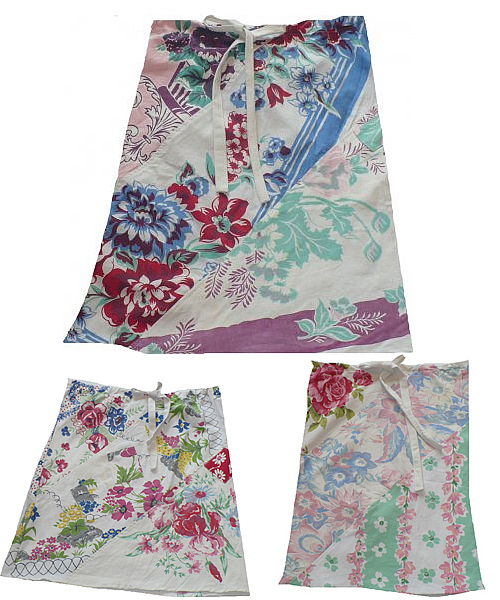 These old tablecloths are perfect for wearing this summer….soft and comfy and colorful.